In a touching tribute to the recently deceased celebrated poet, Maya Angelou, president Barack Obama didn't spare elevated epithets, praising her as "the Barack Obama of poetry" and taking a few ceremonial selfies with his cell phone, having the poet's portrait as the backdrop. The portrait behind Barack Obama features the politically correct depiction of Maya Angelou, his staunchest ally and advocate, holding the first black president in her arms like her beloved child, with the symbolic representation of a "fundamentally transformed" America in the background. The portrait itself was created back in 2012 by the Department of Visual Agitation and Unanimity at the PeoplesCube.com in recognition of Angelou's BET Honors award, which celebrated the poet's unconditional praise of Barack Obama's presidency while blaming any criticism of his performance on white racism and Republican hatred of the first black president. The award from the Black Entertainment Television, which in today's progressive culture is seen as America's highest civilian honor, conclusively topped the downtrodden author's previous Presidential Medal of Freedom, three Grammys, a Pulitzer nomination, and 30 honorary degrees - especially considering that it was presented to her on live TV personally by a stalwart entertainer, Michelle Obama, whom Angelou had earlier described as "the grand dame." "I thought my heart would burst," the poet told reporters later, referring to Michelle Obama's unexpected entrance at the Fifth Annual BET Honors. Ushanka tip to Comrade Margaret for the appropriate headline. George Lucas is the Barack Obama of movie making. That is how he restored the Greatness of the Saga...with the power of hope and Change! So, the science is settled then... from now on, the highest praise for anyone in any field of endeavor will be to earn the title of "The Barack Obama of (name of field of endeavor here). Angelou's use of fiction-writing techniques such as dialogue, characterization, and development of theme, setting, plot, and language has often resulted in the placement of her books into the genre of autobiographical fiction. Angelou recognizes that there are fictional aspects to her books; Scholar Mary Jane Lupton agrees, stating that Angelou tended to "diverge from the conventional notion of autobiography as truth..."
"She made a deliberate attempt to challenge the common structure of the autobiography by critiquing, changing, and expanding the genre." As my saintly mother Victoria Craptek of High Oak once said, "Craptek was created in the image of Obama. Unlike the common rodent, he was born to rule all earthly creatures by divine instinct alone. His brilliance and preternatural grasp of reality was evident from the moment of his birth. For example, at the age of 3 months he invented the microwave oven, television, two versions of the space shuttle, and wrote the definitive history of the planet Venus. After spending a single afternoon at the Craptek family nest, Thomas Edison went directly to his laboratory and invented the electric light bulb." But as we all know, this was only the beginning of Craptek's stellar rise to prominence in the world of science and mathematics. In his later years he reworked Einstein's relativity equations to solve the curious anomalies posed by Quantum physics and Planck's constant. Finally, settling down to a simple life of beet farming and nut collecting, Craptek remains a familiar and highly sought lecturer at research centers around the world. He is currently instructing scientists at the MIT Artificial Intelligence Laboratory and the CERN Large Hadron Collider in the proper use of contractions when crafting character limited Twitter comments. Followers of Pajama Boy & Julie,Look at her face. She is thinking, "this part white man who defends from his grandmother and slave holders is killing me! I would like to strangle the life out of him." Well we, his unfortunate family, agree. This hamburger eating, french fry gulping, lard sucking glutton remains emaciated, especially between the ears, while we, the ones with slave blood, gain 10 pounds every time we dream of Ben & Jerk's deep fried Crisco flavored ice-cream. The man's (?) teleprompter can't write poetry any more than it can keep the leach from saying 'Marine Corpse.' Obama Care did not kill her, the list to get on the waiting list to get onto the computerized waiting list did. Maya Angelou did a remarkable job of teaching Bill Ayers fiction-writing techniques & how to diverge from the conventional notion of autobiography as truth, as mentioned above, when Bill penned two autobiographies of the illiterate dolt; take your pick or write another fiction. Artificial intelligence will never be able to screw up enough to write poetry or yet another autobiographical fiction for our Buffoon. Remember, we represent a large body of opinion! Sincerely disdaining of America, The Female Buttzes.PS. Remember Pork IS the other white meat. Eat or be eaten. Now Maya Angelou was poetry? How artsy fartsy you commies do but get with your fawning praise. She was definitely the Barack Obama of poets. No one can deny that. Out of the mouth of stupid he damns her with his praise. This will make for glorious reading when we get back from the beet fields every day. You must hurry to finish this glorious autobiography... it's for the children and the beet diggers. Angelou a poet? None of her stuff rhymes, the word " Nantucket" never appears, I'm not buying it...no qualifications! Comrades, we tread on dangerous ground to suggest that any presently living human being could be compared to The BO. Old dead white slaveholders may be demeaned in comparison; and deceased personages approved by The Party™ may be described as the BO "of their time"; BUT, the message must always be that there was no real perfect being until the coming of His BOness, and there never will be again, so he needs to remain king emperor ruler in office until Moo says otherwise. There is no BC or AD, there is only BBO and BO. Nor is there any AC/DC, but all the many rainbow colors of the alphabet. No ACDC because our anorexic leader has eliminated power plants. Furthermore his interest in transvestites, weddings of humans and animals, and future weddings of humans and inanimate objects further makes irrelevant the matter of AC/DC. We are to be powerless and shovel ready. Hail to the chief. Putin is in awe of Obama, who has destroyed America quicker than he ever could. Regress more and we will only dream of the good old days of beet farming. Without farming it will be Beet Off. That is the true meaning of BO. Captain! We were all so kollektively proud of you when you appeared on Colbert's little dog, pony and squirrel show! I hadn't heard that I was invited to appear till I saw myself on TV! The Barack Obama of (insert oppressed group here) would have read it in the papers. Or perhaps had it explained using small words and big pictures? Perhaps my favorite quote ever! 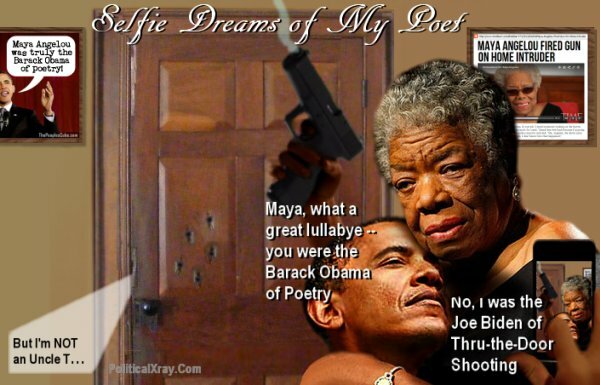 In "Selfie Dreams of My Poet," Barack Obama says to the Spirit of Maya Angelou, "Maya, what a lullabye, you were the Barack Obama of Poetry," to which the Spirit of Maya replies, "No, I was the Joe Biden of Thru-the-Door Shooting" in a mystic allusion to the video of Maya's interview by TIME, in which Maya explains her ownership of, and fondness for, guns, and the time when she shot through the front door to stop an intruder (as reported by Breitbart). Immediately after the sounds of the shot, on the other side of the door, she heard a voice (sounding in pain) saying, "But I am NOT an 'Uncle Tom.'" Such a nurturing comrade Maya Angelo is. Look, she just breast fed the president obviously symbolic of our nurturing progressive ideology.